I could write for hours about HOW MUCH I LOVE THIS MOVIE—how completely satisfying it is—but I'll be brief and vague, so that you may relish it with similarly wide eyes. Just know it's a film that is, for once, at least 80-85% as good as the trailer and hype, one that "gets it mostly right" by putting the best dimensions of, say, Jason Bourne, David Banner, Kwai Chang Caine, John Rambo, A Beautiful Mind, John Wick, 007's M, Forrest Gump, Rain Man, Dr. House, and Sherlock Holmes all in a papoose woven nice and tight. Evergreen traits, fresh as pine as presented here. That's a pretty fair assessment of its legitimacy, putting it at 8.1 on IMDB, same as Gone Girl and just 4/10ths of a point away from classic The Usual Suspects territory. It deserves every bit of praise, and will do for CPAs and forensic accountants what Forrest Gump did for shrimpers or Manhunter/CSI for unassuming crime scene techs. AND, it shows great promise as a Jack Reacher or Robert Langdon type franchise, though it might be best to leave well enough alone. Yeah, probably so. "Always be yourself, unless you can be Batman...then always be Batman" will likely become, "Just be Christian Wolff" or, "Christian Wolff that thang." p.s. J.K. Simmons gets to simmer at his very best, back to Law & Order sorta days versus, I dunno, that shrill Spider-Man schlock. 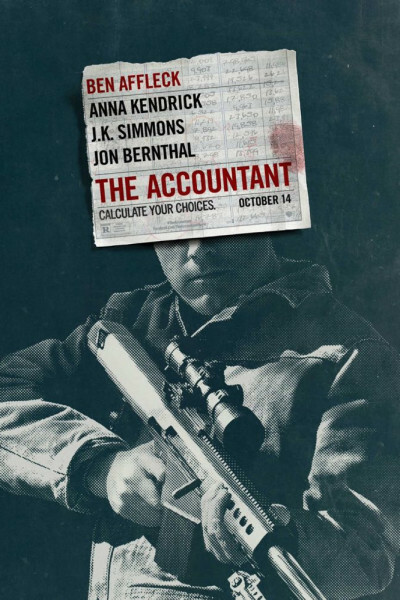 This fact alone makes The Accountant worth auditing. p.p.s. We have seen it twice now. Seeing it thrice later this week.